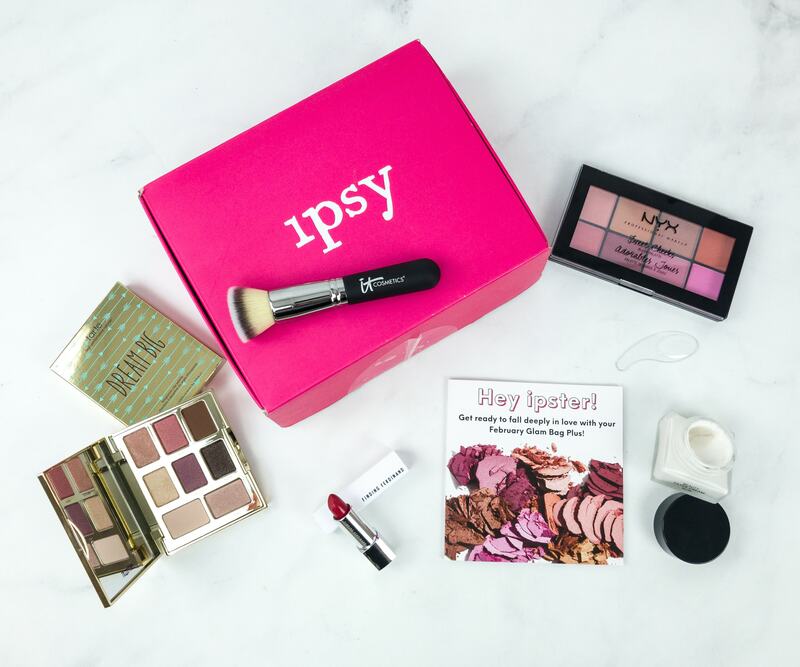 Ipsy Glambag Plus is the upgraded version of the monthly Ipsy Glam Bag. 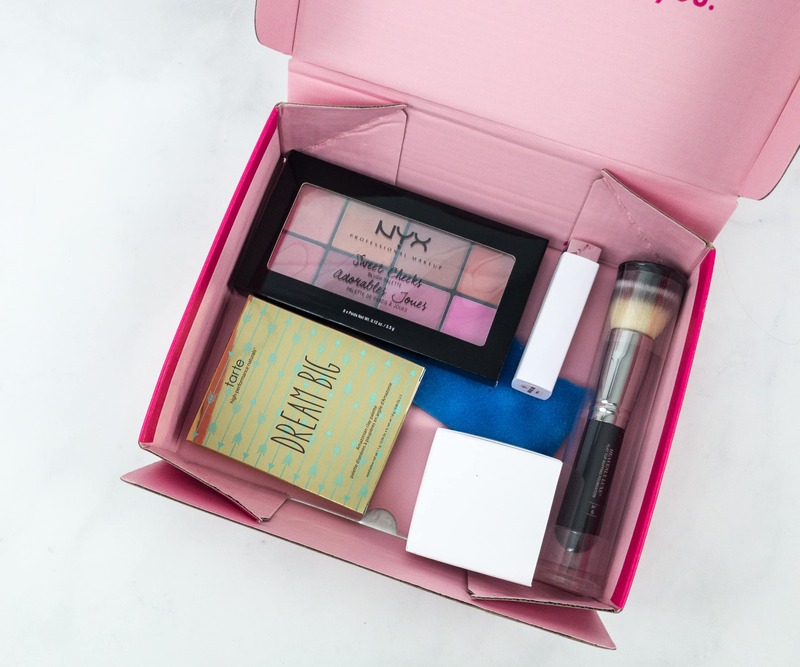 For $25 a month, it contains 5 full-size products from brands you love, plus a deluxe makeup bag with every third shipment. The promised value of each box is $120 worth of products. 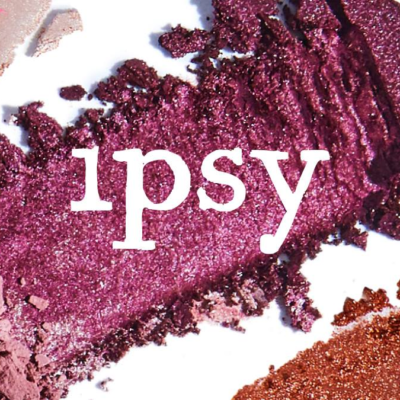 It will contain variations, but there are far fewer compared to the regular Ipsy Glam Bag. Be sure to continue to rate and review your bag to help personalize it to your needs. 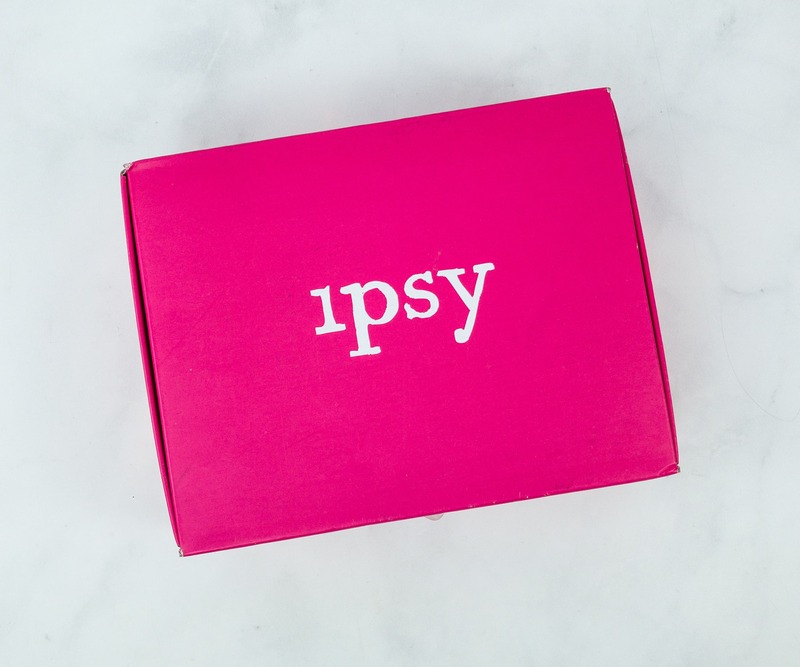 Check out our Ipsy Glam Bag explainer to find out every detail of this subscription! 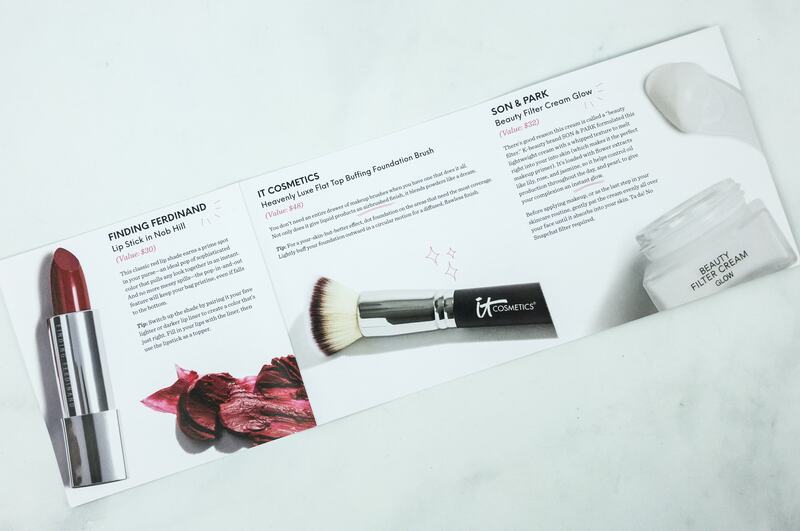 FYI, starting this month, this subscription will no longer include the quarterly makeup bag! The items come with a blue foam topper to secure all that valuable makeup and skin care loot! There’s a foldout card that comes with the upgraded box, unlike the regular glam bag which only has a card without individual item details. 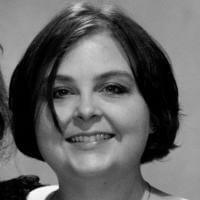 Each page features a specific product and its description. 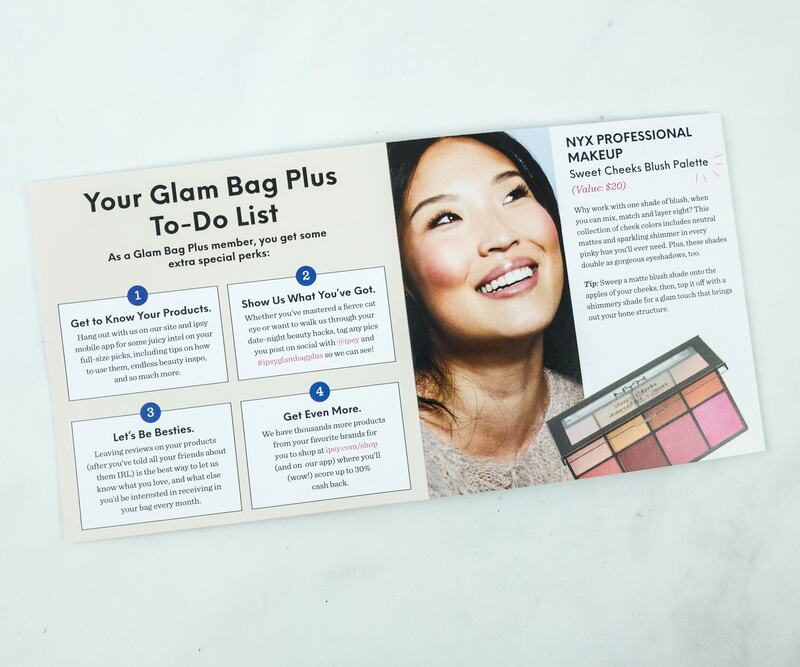 The mini-mag also provides a to-do list with the upgraded glam bag. 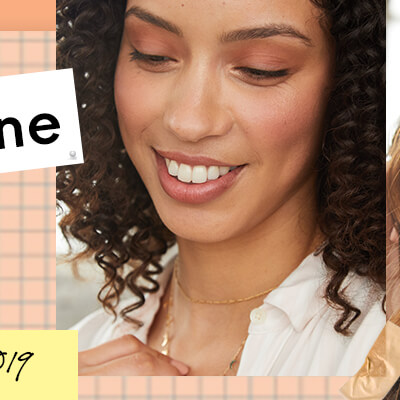 It also includes short notes from Ipsy creators. The pictures are all high-quality. The info cards are very useful to get an overview plus its retail price for your reference if you want to know the whole worth of the box. Everything in my Ipsy Glam Plus bag! 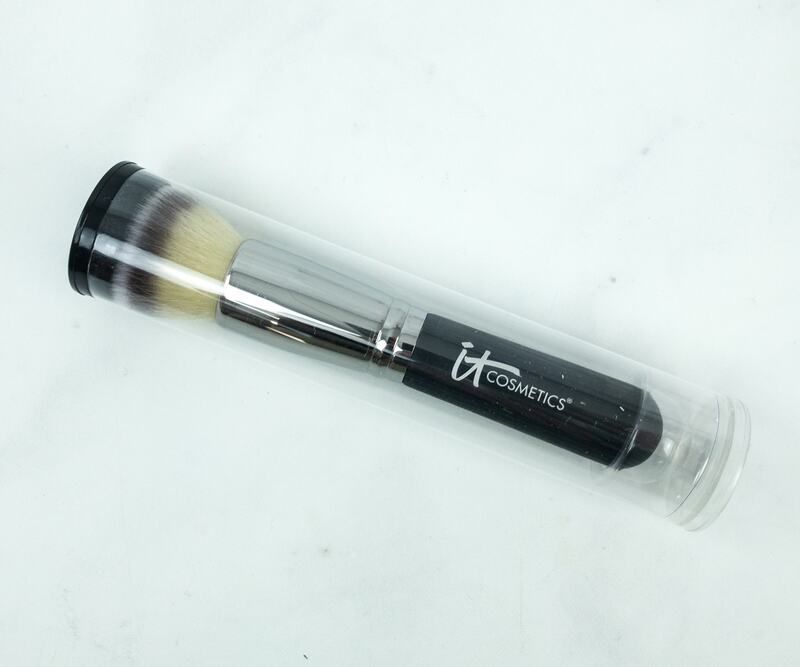 IT Cosmetics Heavenly Luxe Flat Top Buffing Foundation Brush #6 ($41) This densely packed flat-top brush is made for your favorite loose and pressed powder foundation application. 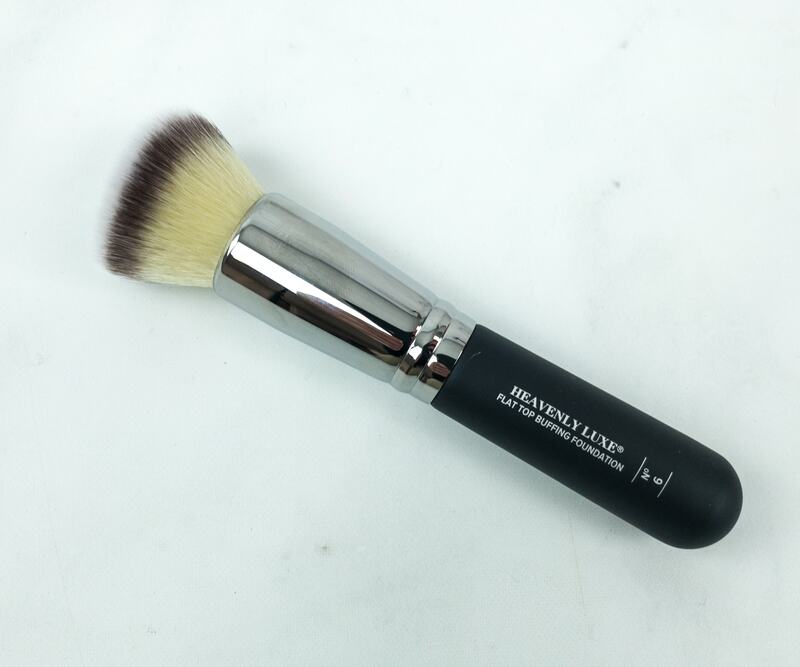 It has what it takes to be my go-to tool for super quick airbrushed perfection. The soft-touch handle also lets my hand glide lightly, resulting in an even finish. 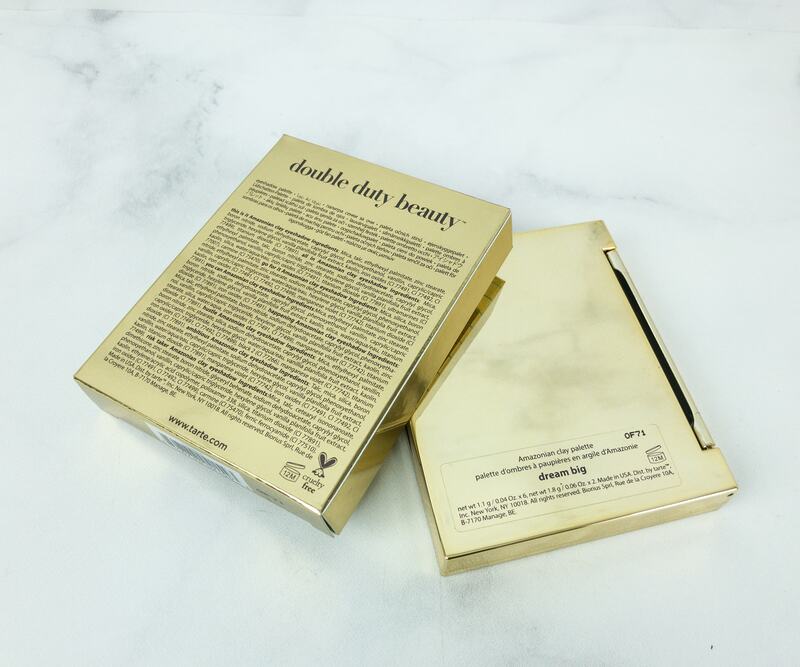 Its mega-high hair count (Heavenly Luxe synthetic hair) delivers the most effective distribution of foundation, allowing you to achieve a beautiful coverage and intense glow. 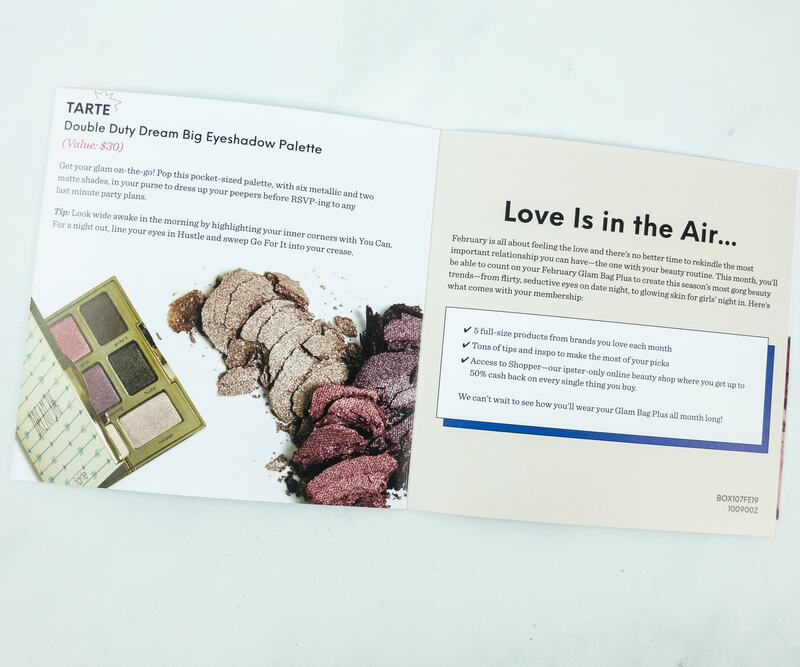 Tarte Dream Big Eyeshadow Palette ($30) The packaging of this palette is totally right up my alley. I adore the gold, glassy frame and the arrow details. 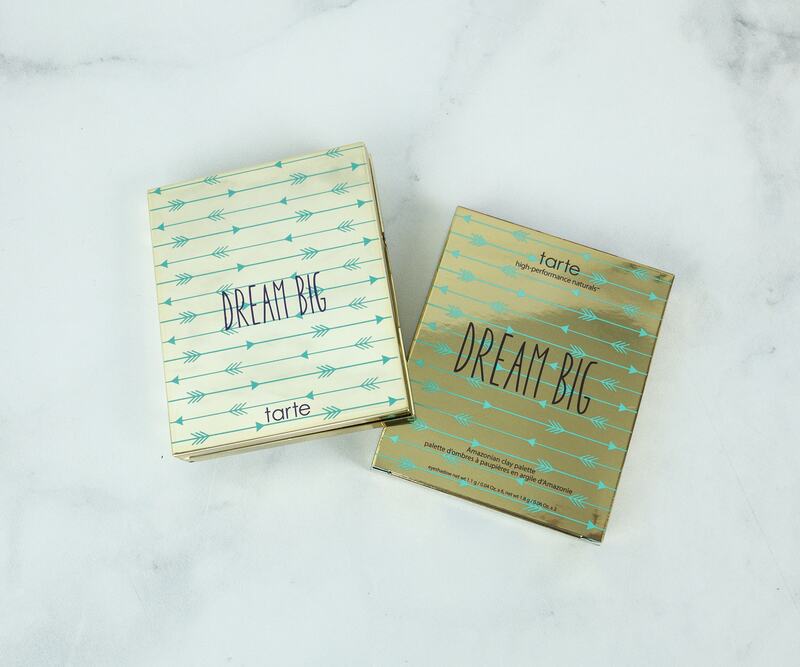 The message “Dream Big” also projects good vibes. I also find the label behind each package pretty neat. It has the description of the product and a list of ingredients which I always make sure to check in case it contains something that I’m allergic to. In this case, none. It’s pretty cool how the label for each shade gives a character to it. Like if I wanna look confident, I’d go for the shade that says “go for it”! 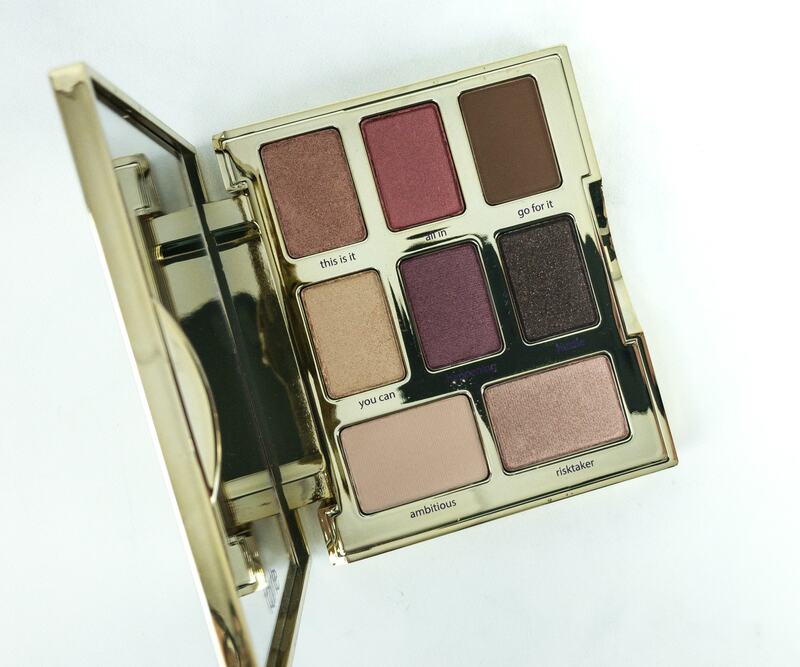 This palette has a bright color selection, but I personally love the bronzy shade (rose gold). Each clay contains oil-controlling ingredient so it stays put until you wash it off. 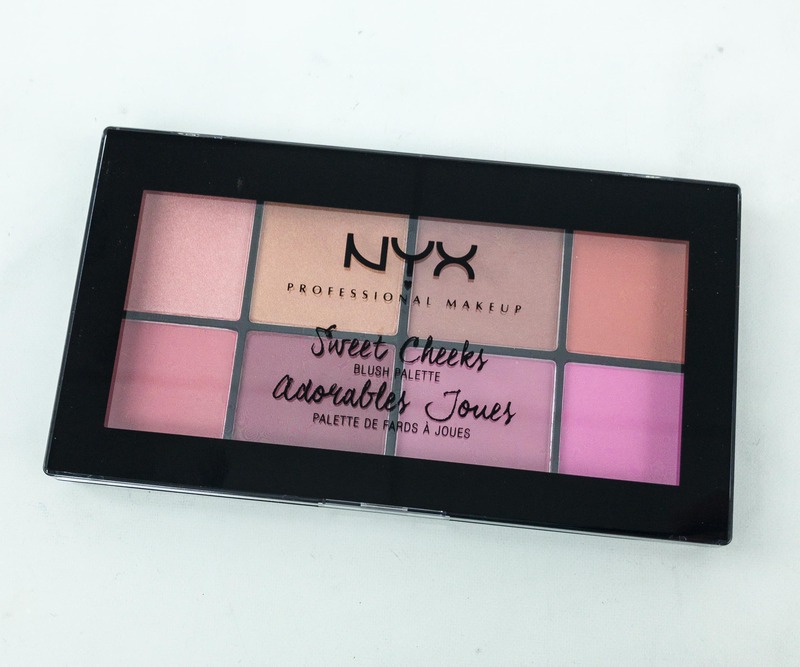 Nyx Professional Makeup Sweet Cheeks Blush Palette ($20) I was literally blushing when I saw this one in the box. 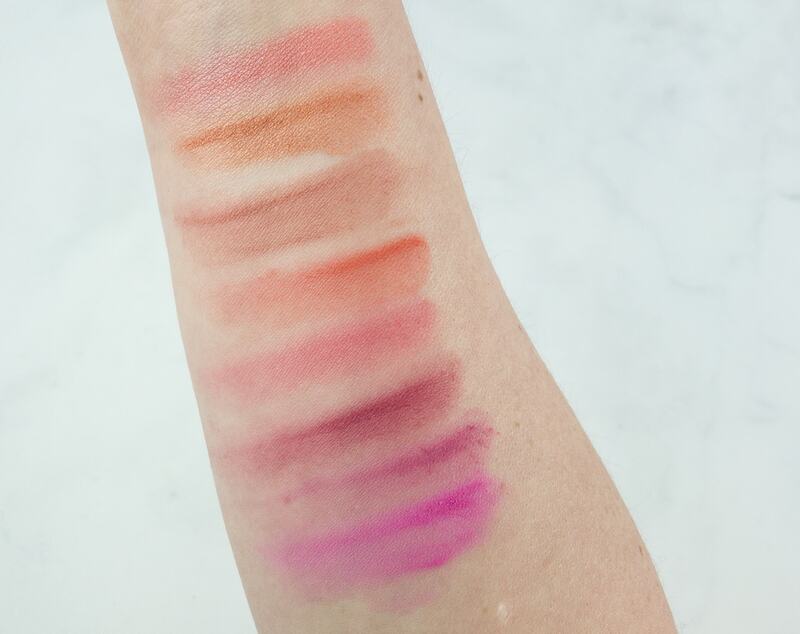 I don’t know about you, but I think blush is the makeup product that I can never say no to. Especially if it’s from Nyx. 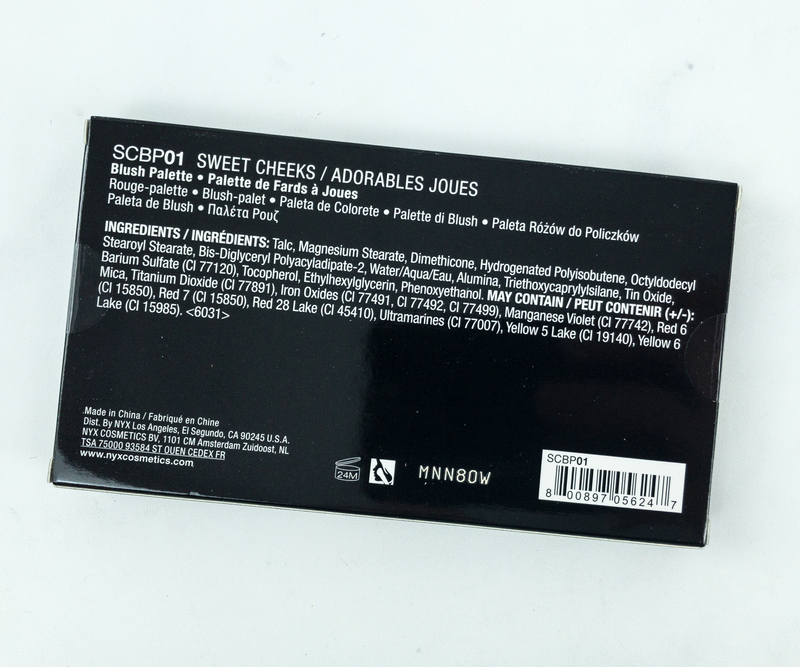 The list of ingredients and details about the manufacturer are also printed right at the back of each box. 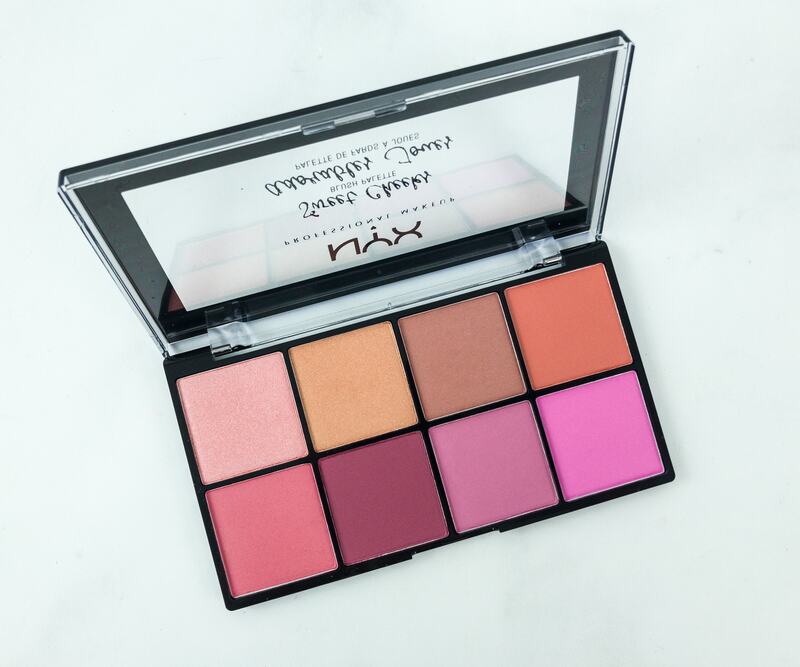 This collection features eight highly pigmented and buttery-smooth colors that flawlessly suit any skin tone. 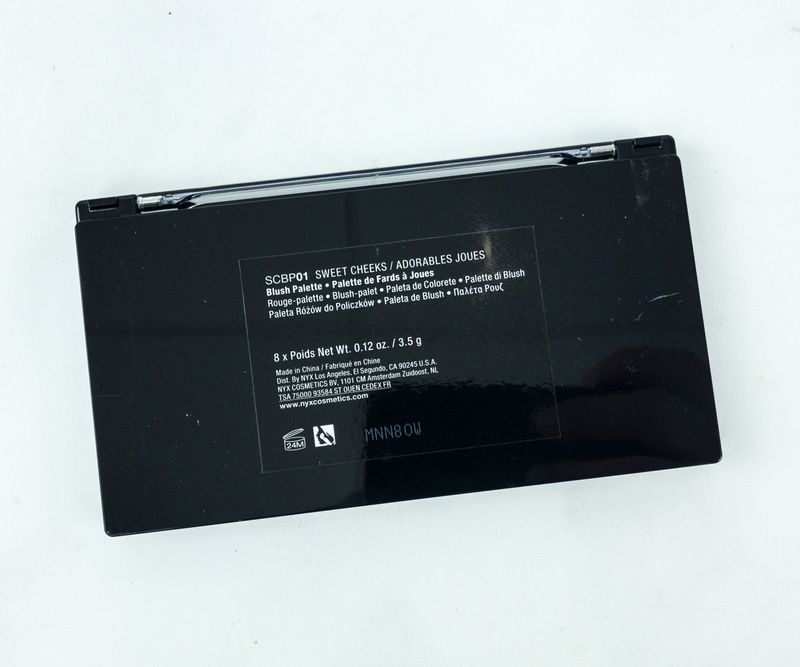 Another label can be seen at the back of the actual palette case. 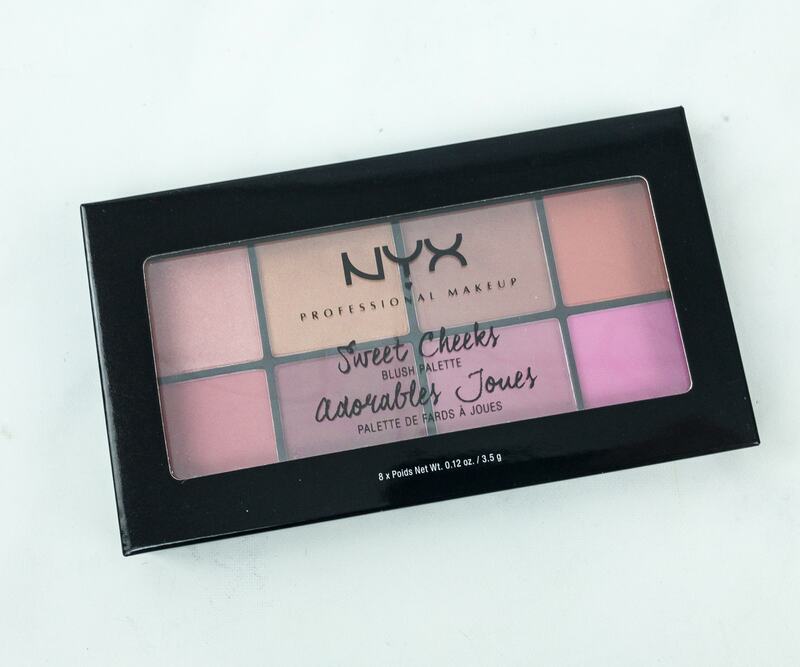 The Sweet Cheeks Blush Palette set brings together a variety of exclusive shades in both matte and shimmery finishes. If we have the same skin color, then this is exactly how every shade will look on your cheeks. 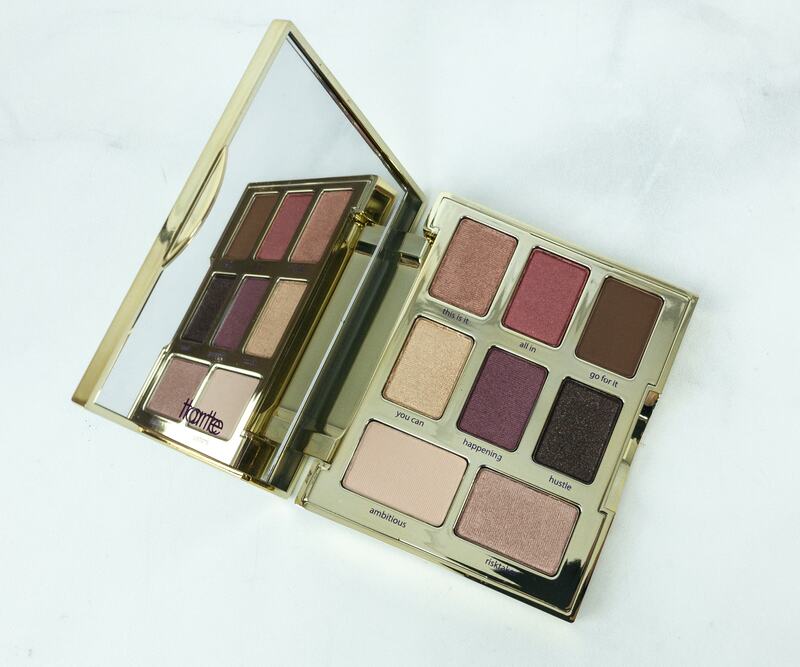 The matte shades are nice and the shimmery ones are so creamy and pigmented. I think the light ones suit me best. How about you? 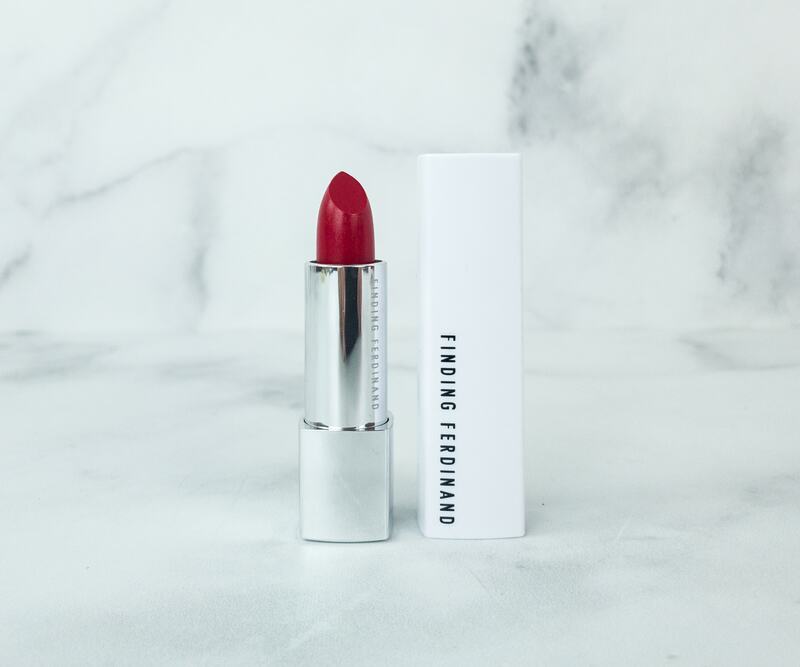 Finding Ferdinand in Nob Hill Red ($30) Now for the lipstick, I think my glam look won’t be complete without it. 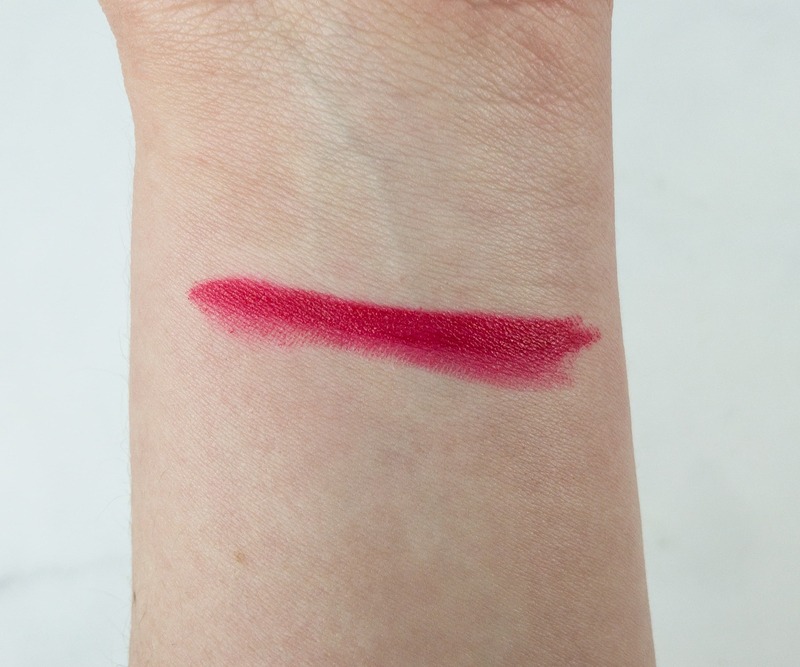 Actually, this Nob Hill Red shade is perfect for every mood, in any kind of day. This lippie also has push-in click packaging tube. I’m absolutely in love with how this bright, poppy rouge color goes well with my skin tone. Also, the moisturizing blend of botanical oils allows lip colors to apply smoothly. It also has natural sunscreen protection factor. 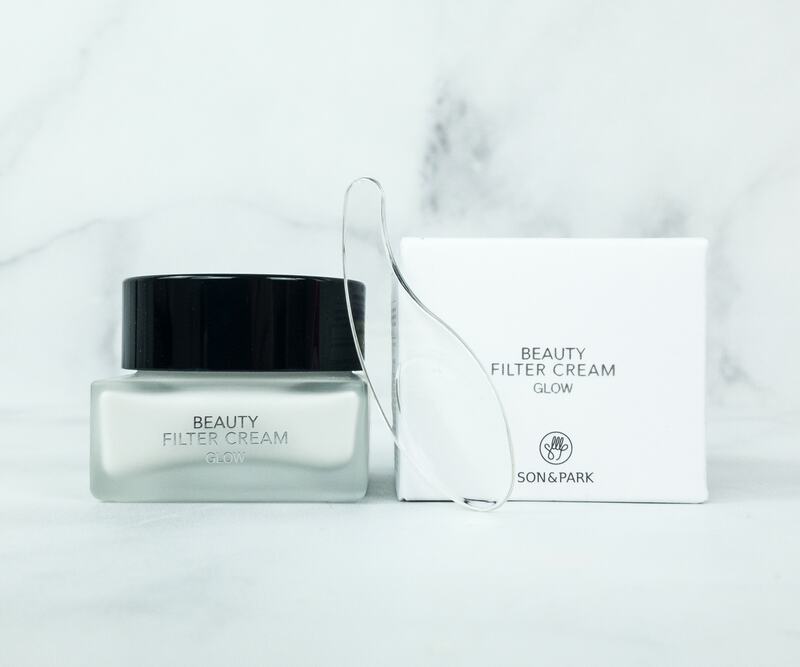 Son & Park Beauty Filter Cream Glow ($32) Attention all selfie lovers! This is what they call “photoshop in a jar” because after using it, your skin will look brighter, smoother, and more even as if you actually wear a real-life filter. 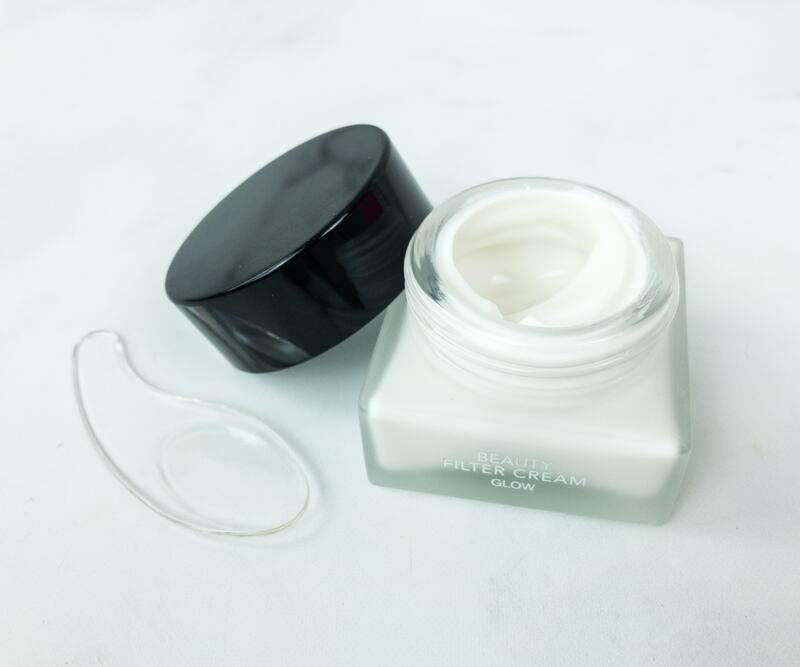 This lightweight base cream is packed with flower extracts you’ll love, including lily, rose and jasmine. They also added pearl to illuminate the complexion. It’s truly the secret to glowing, picture-perfect skin! Unboxing this package was a happy experience for me. I got too excited when I saw two palettes that I almost shrieked, but who can blame a woman who has a soft spot for cosmetics, right? Anyway, if I am to rate this month’s box, on the scale of one to ten, I’d probably give it a 8. Everything went well for me except maybe for the eyeshadow. Just for the minor reason that it doesn’t have much of a color transition, but other than that, it’s still wearable for me. On that note, here’s one final tip in using the eyeshadow: I highly recommend spritzing your brush first to make the color really pop! 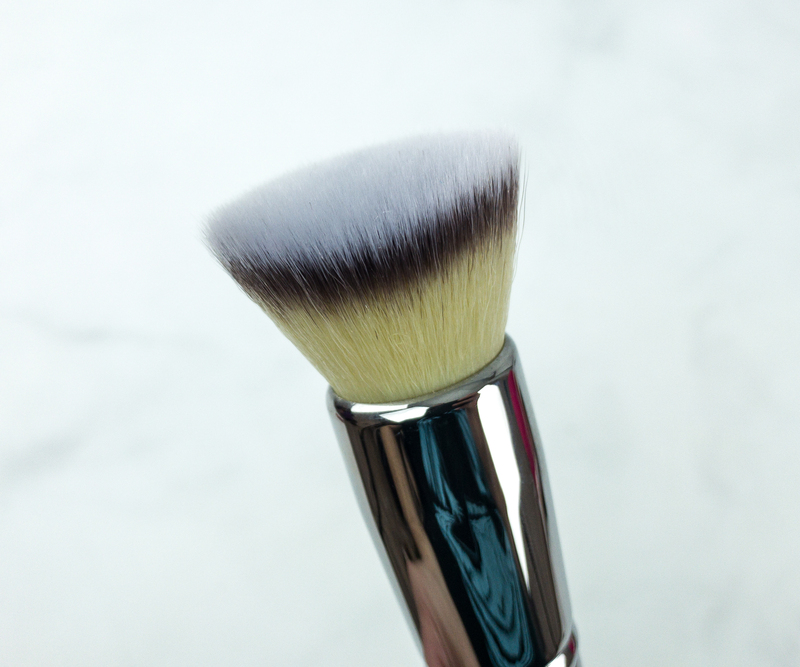 My FAVE item is the brush – it’s one of my favorites and one that I’d purchase myself. 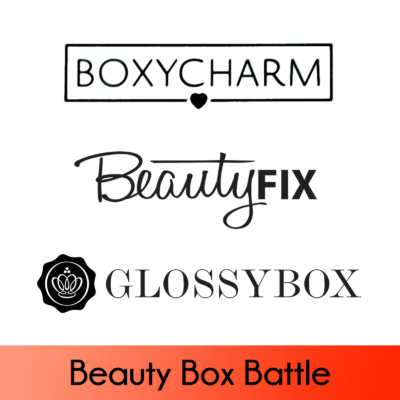 It’s also an item that I’d say Ipsy outdid Boxycharm on if you’re looking to compare. Total value is about $153. What do you think of Ipsy Glambag Plus? 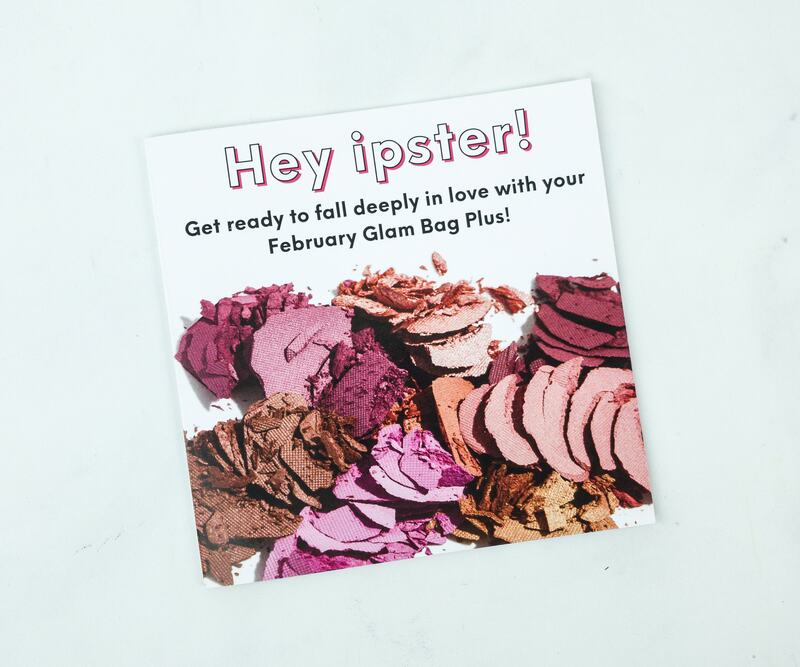 Visit Ipsy Glambag Plus to subscribe or find out more!